There are too many interesting things to see and do in San Francisco to capture in a single article, but here are a few of the notable attractions that I would definitely recommend to anyone visiting the city for the first time. Here they are in no particular order. This is the first thing anyone will suggest when you ask for things to see and do in San Francisco, so here we go! 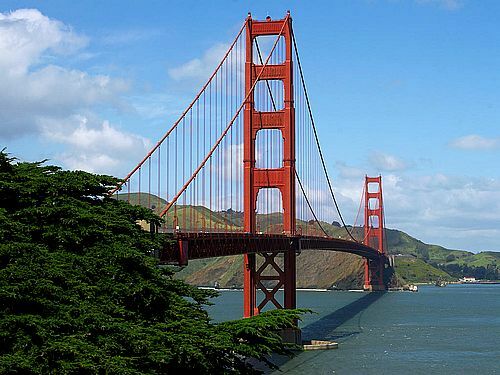 This is one of the world’s most famous and highly photographed bridges and one of the most popular San Francisco attractions. If it’s your first time in San Francisco it should definitely be one of your first stops. You can walk across the bridge or just admire it from afar, either way the sights around this area make for great photo opportunities, especially if you catch it on a sunny and fog-less day. Be prepared for lots of tourists, and probably cool and windy weather. If you’re looking for what to do in San Francisco but don’t want to stick to the usual touristy attractions, why not go see a baseball game? 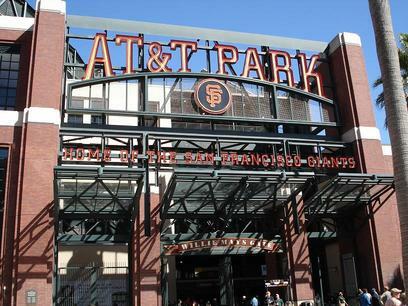 AT&T park is the home of the 2010 and 2012 World Series champions! The park is located at 24 Willie Mays Plaza, at the corner of Third Street and King Street, in the South Beach neighborhood of San Francisco. If you happen to be here during baseball season it would be worthwhile to try and gets some tickets to catch a game. This is definitely one of the nicest baseball stadiums around with a very classic old time feel and amazing views. Play ball! This is a definite “must see” item on our “what to do in San Francisco” list. However, this San Francisco attraction is not actually in San Francisco. Drive about 20 minutes north of the city across the Golden Gate bridge and you’ll be able take a relaxing walk and admire the awesomeness of these giant ancient trees, in some cases thousands of years old. Standing next to one of these giants is a humbling experience. 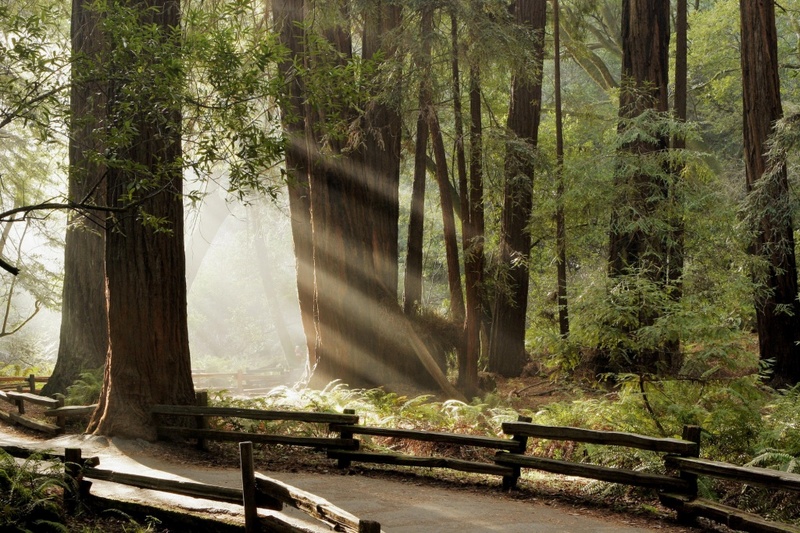 Smell the fresh scent of nature while experiencing one of the few remaining Coastal Redwood forests, unique to this part of the world. The park offers tours daily and charges a small entry fee of 5 dollars. 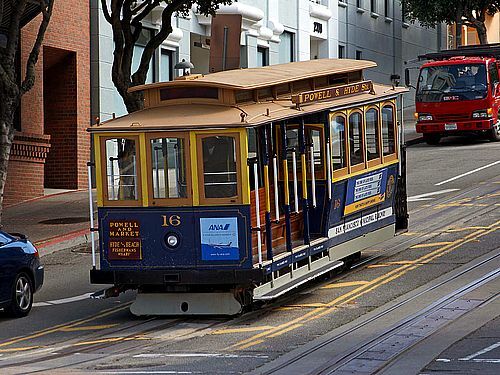 Another “must do” activity for the first time visitor, San Francisco’s cable car system was first established around the end of the 19th century, and is now considered a “moving” National Historic Landmark. The cable cars run along Hyde, Mason, Powell and California streets. You’re best bet is to get on at the turnarounds, as they tend to be full and the car operators often can’t take on additional passengers along the way. The California Street route is a good option if you want to avoid the lines, and stops next to Chinatown. 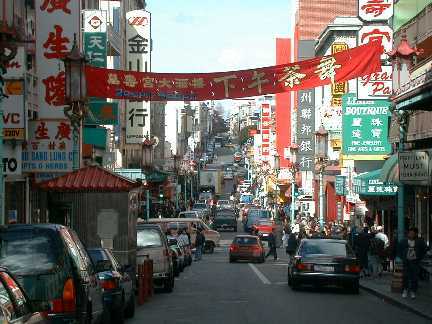 Another interesting idea if you’re wondering what to do in San Francisco, is to visit San Francisco China Town, one of the oldest Asian communities in North America, which is like a city within a city. Wander around, take in the sights, and browse some of the the many shops selling authentic Chinese fare. If you’re hungry, this is a great place to stop for lunch at one of the many dim sum Tea Houses, or just pop into a shop and grab something to go. 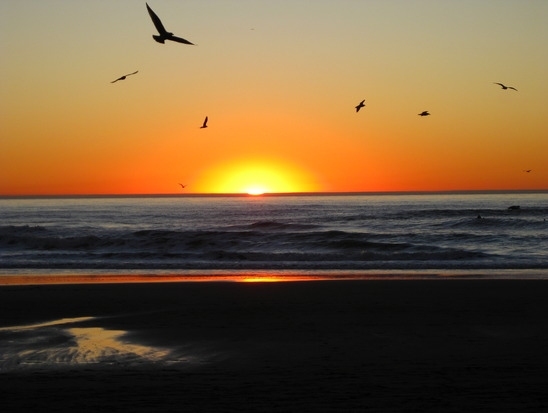 Ocean beach is the largest beach around the city and host to some of the most spectacular sunsets around. Be warned however that this is an area prone to very foggy days in the spring and late summer, and can actually get quite cool. I if you happen to catch a clear day, it’ll be one of your most memorable. This is a definitely must, especially if you’re wondering what to do in San Francisco on a warm sunny day. The water at Ocean Beach is noteworthy for its strong currents and fierce waves, and is very popular with serious surfers, but can be dangerous for the casual swimmer due to the strong currents and cold water. Lincoln Park is located at the Northwestern tip of the city and provides one of the most scenic walking trails you’ll ever see. Starting from Sutro Bath Ruins and the Cliff House, you can walk along Lands End Trail and enjoy a great view of the ocean and the Golden Gate Bridge, ending up close to China Beach Park and the Sea Cliff area. 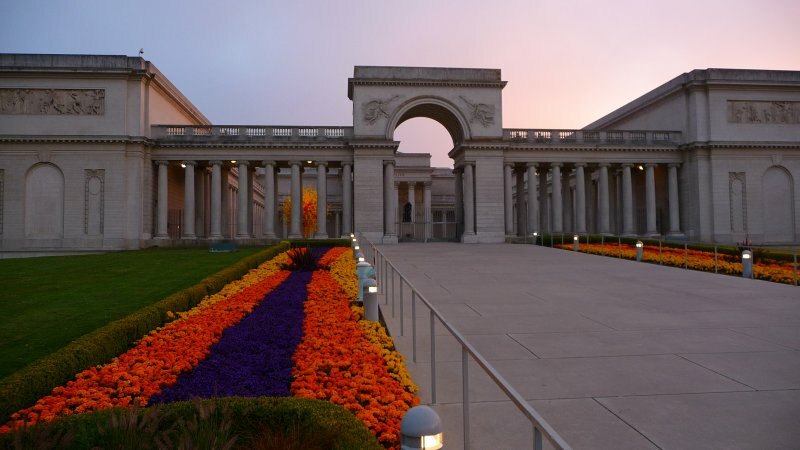 The park is also host to the Palace of the Legion of Honor, a museum which displays a collection spanning more than 6,000 years of ancient and European art, and is one of the most interesting and cultural activities to do in San Francisco. 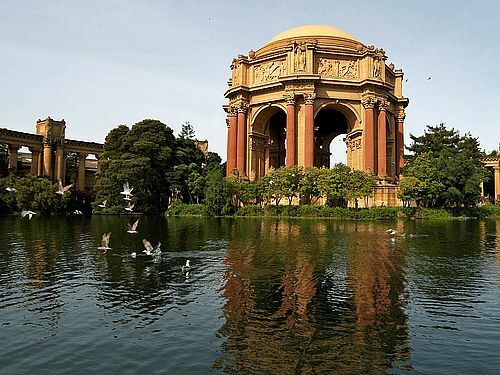 The Palace of Fine Arts is located in the Marina District and is a monumental structure originally constructed for the 1915 Panama-Pacific Exposition in order to exhibit works of art presented there. The site is also home to the Exploratorium, an interactive museum that explores science, art, and human perception. The site is one of the most dramatic San Francisco attractions. It has a serene and almost surreal feel to it, and aside from being a great photo opportunity, is a great place to relax, maybe enjoy a picnic and contemplate the rest of your visit. If you like shopping and are looking for what to do in San Francisco, or just want to hang out and observe the locals, head to Market street. 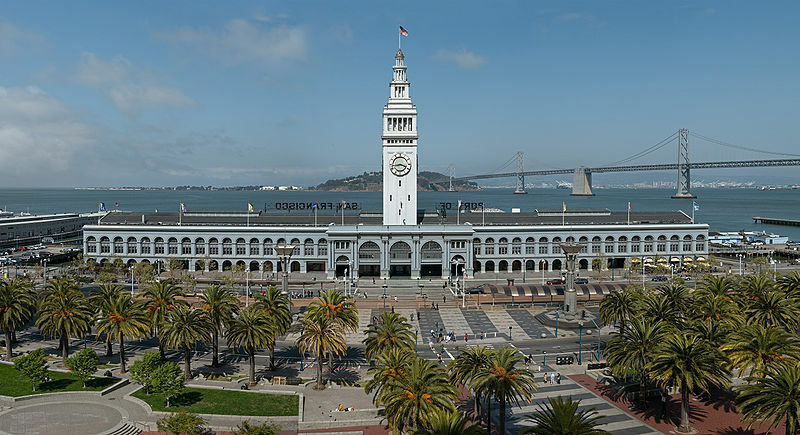 Market street is one of the major commercial thoroughfares of the city and leads straight to the Ferry Building, site of weekly outdoor farmer’s markets on Saturdays as well as many indoor shops and restaurants. You’ll enjoy great views of the Bay Bridge and can walk along the Embarcadero, which runs along the edge of the water and provides access to most of the city’s piers. 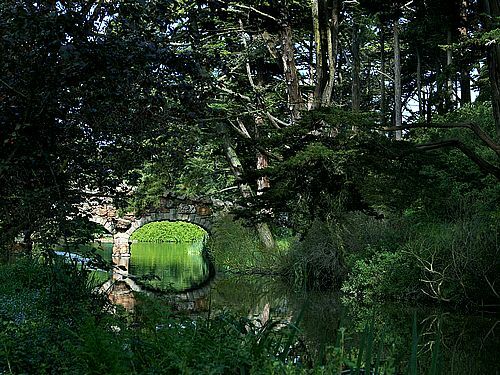 Golden gate park is essentially San Francisco’s version of “Central Park”. This park is host to numerous San Francisco attractions, such as the Japanese Tea Garden, Stow Lake, the Academy of Sciences, the de Young Museum, and many more. The park is one of the most popular recreation areas for locals and is host to many events year round. The park provides miles and miles of paved trails surrounded by lush, green fields and lovely waterfalls for pedestrians or bike riders to enjoy. Cycling is also especially pleasurable on Sundays when some of the streets become closed to automobiles.